de Havilland entered the jet era in typical fashion by putting its broad range of aero-engineering skills straight to use. Not only did it make its own jet engines (the Halford H.1 being the first, used initially in the rival Gloster Meteor) but it produced complete military and commercial aircraft of often radical design, such as the tailless, ill-fated DH.108 Swallow, all three examples of which were destroyed in fatal crashes. One such crash claimed the life of Geoffrey de Havilland Jr., son of the company's founding father, in 1946. Operational roles started with the twin-boom DH.100 Vampire jet fighter and continued with the similarly equipped DH.110 Sea Vixen for carrier deployment with the Royal Navy's Fleet Air Arm. In the commercial field de Havilland was equally ambitious and with the DH.106 Comet launched the world’s first commercial jet airliner in 1952. Early aircraft failures due to challenges previously never encountered by aircraft manufacturers led to extensive redesign work and slow sales, but despite rivals such as Boeing learning from de Havilland’s problems and leaping ahead, the Comet astonishingly continued in service until 2011, in the form of the RAF Nimrod airborne early warning aircraft. Despite other advanced work on Blue Streak ballistic missiles and even satellite launch rockets de Havilland was unable to gain enough commercial contracts and in 1960 was taken over by Hawker Siddeley. The company's designs continued, with the DH.121 entering commercial service as the Hawker Siddeley Trident, but the iconic name eventually disappeared. Hawker Siddeley itself disappeared into British Aerospace in the 1977 nationalisation of the remains of the British aerospace industry. An era of British private aircraft companies, led by its most pioneering engineers, passed into the history books. The museum itself is a delight and a wonderful example of what can be achieved by volunteer enthusiasts rather than government largesse. Yes, it can appear ramshackle but that’s part of the charm. It remains completely run by volunteers and without any government support the musuem has added hangars and exhibition space as funds allow, and continues to restore and maintain the planes held there in full view of visitors. The volunteer ethos running through the museum also means more interaction than you would expect. The team like messing about with aeroplanes and so want you, the visitor, to get as hands-on as possible too. If an airliner's door is open, poke your head in and have a look about. If a cockpit is open, jump in and feel for yourself what flying that aircraft must have been like. The initial push to preserve and display de Havilland aircraft came from a Walter Goldsmith who bought Salisbury Hall after the war and realised the Mosquito had been designed there. Contacting the company's PR department, he found out the original prototype, serial number W4050, was still in Hatfield and needed a home, which he graciously offered. The Mossie arrived in 1959, making the de Havilland Museum the oldest aircraft museum in the country and unique in displaying a prototype on the original site where it was designed and built. Over the years more aircraft arrived, always with an association with de Havilland or the site itself. Early pre-war exhibits include the Tiger Moth and the aforementioned Queen Bee, plus oddities such as a Cierva C.24 helicopter, for which de Havilland produced the airframe. The Second World War part of the museum is all about the Mosquito and they have three examples, the world’s largest group of the aircraft. Alongside the prototype are both fighter and bomber variants plus an extensive display of weaponry options, including the impressive 4,000lb blast bombs, cannon and machine guns. They also have examples of the drop fuel tanks used to extend aircraft range and even bulletproof windscreens! 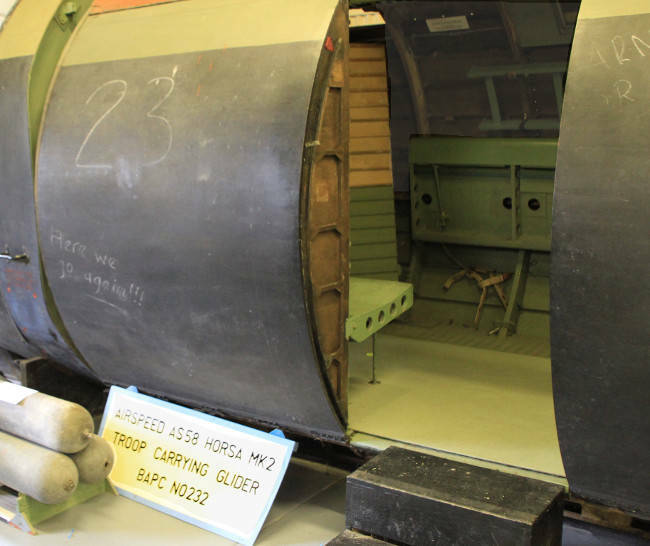 Another item of note from this period is a section of Handley Page Horsa fuselage, from a glider used to drop paratroopers behind enemy lines. Aeroplanes from the post-war period are well represented and, being larger, can be mainly found outside. They include the Vampire and Sea Vixen military jets and examples of both the Comet and Trident airliners, plus light training aircraft such as the Chipmunk. Alongside the planes are also displays on the company history and development of the jet engines from the later years. The museum is completed by of course the museum shop, for you to stock up on aircraft models, books and the necessary refreshments. You can still see the original hangar entrance set in concrete next to the hall. 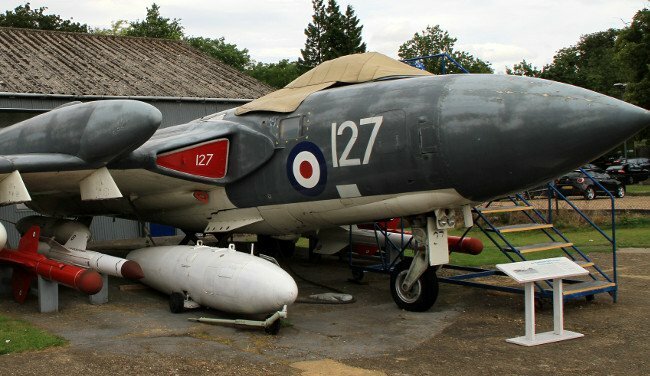 The museum is located next to Salisbury Hall at junction 22 of the M25. NB: If you are travelling clockwise on the M25 (ie: from Heathrow, M1) you will need to cross back over the bridge on the M25. The museum is sign posted ‘Mosquito Museum’ from the London Colney roundabout and is on the B556 to South Mimms. The museum is open from the first Sunday of March to the last Sunday of October. Opening times are eccentrically Tuesdays, Thursdays and Saturdays from 12:00 - 17:00, then Sundays and Bank Holidays 10:30 - 17:00 with last entry at 16:00. The cost of entry is £6.00 for adults, £5 for senior citizens / students and £4 for children of 4+. Family tickets are at £16.00. Private tours and group booking by arrangement, phone for details. See the official website for more details. Willows Farm - good for smaller children who may not want to look round the museum. Colney Fields Retail Park – Museum volunteers suggest it’s a good place to drop off reluctant members of your family!